Doug Bradley was approached to reprise his role of Pinhead, but became hesitant when told that there would be no second draft of the script, which he believed was neither good nor bad, just "not finished." Bradley ultimately declined after being told that his salary from previous films would be, in his words, cut down to "the price of a fridge." Out of many bad sequels...the worst. None of the films have been as good as the first three in this series. This one is no different. Most of the acting, especially by the lead antagonist, Nick Eversman, is terrible. The effects and gore are nothing more than copies of scenes from the other movies with nothing new added to make it any more interesting. 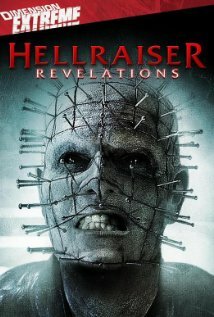 I love the original Pinhead character, played by Doug Bradley in all of the other films. Stephan Smith Collins who portrays Pinhead in this sequel tries to recreate him but manages doing a poor man's imitation, instead of bringing anything new to the screen. To future writers of any more sequels: STOP! Either come up with a new lead so we don't miss Bradley's performance so much or reboot the series from the start and try to come up with something new. Maybe consult with Clive Barker to see where he would go with it. Or better yet, put together some real money and have him write it instead.